Part XXIV in our ongoing series on Race, Racism and the Middle Ages, by Richard Cole. You can find the rest of the special series here. This article is split into two parts; you can find the first half, “The Importance of Being Absent”, here. One way to understand the medieval Scandinavian interest in stories about Jews, and how a total lack of Jewish immigration might have shaped that interest, is to turn to similar situations from other times and places. Medieval Scandinavia had no Jews. Yet its art and literature display every indication that Christians were very attracted to and emotionally affected by anti-Semitic images. This might sound a little strange, but as an Englishman, I can’t help but think about the town of Clacton-on-sea. 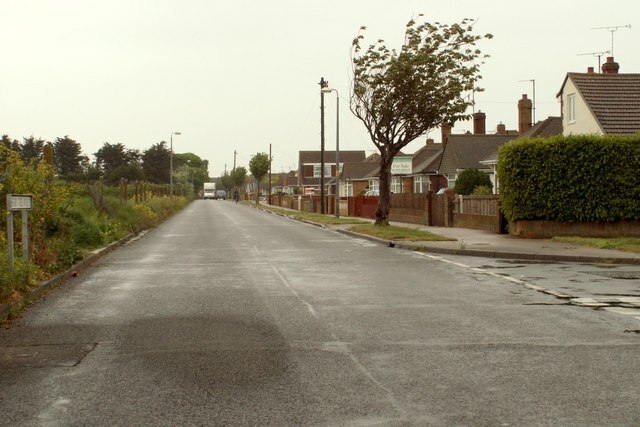 A sleepy street in Clacton-on- Sea, United Kingdom. Image courtesy of Robert Edwards. In 2015 Clacton-on-Sea was one of the economically challenged towns in Britain where there was phenomenal support for right-wing (arguably even far-right) populism. Different aspects of the right-wing worldview appeal to different people. Some may appreciate its economic arguments and dislike its racist obsessions. Others may feel the opposite way. But it still seems largely uncontroversial to say that serious hostility to immigration—particularly non-white immigration, particularly immigration by Muslims—is integral to the sort of politics which was (and likely still is) popular in Clacton-on-sea. Mona Chalabi, a data journalist, analysed figures from the Office for National Statistics and professional polling companies (www.Electionforecast.co.uk) to suggest what might indicate that a place is more likely to vote for the right-wing populist party, UKIP. Chalabi found that, as ever, there were lots of factors at play. But, there was a significant correlation between a lack of non-white people and a support for strongly anti-immigrant politics. Correlation between number of ethnic minorities present in a given parliamentary constituency, and what percentage declared they would vote for UKIP. Image courtesy of Mona Chalabi / www.fivethirtyeight.com. There is an Olympic-swimming-pool-sized amount of caveats to be made here, of course. Note the cluster of constituencies (British electoral districts) in the bottom left corner of Chalabi’s graph, where the non-white population was minuscule and so was UKIP support. There are also places where the ethnic-minority population was as high as 20%, and support for UKIP was nearly as high as in largely mono-cultural Clacton. So we absolutely cannot say that a lack of immigration automatically makes people excessively worried about immigrants they’ve never met. But we can say that it sometimes does. In multicultural communities, frictions can intermittently arise when two cultures live alongside one another. But in monocultural societies, people’s fantasies about other cultures can run riot, with prejudice and folklore undisturbed by actual experiences of foreigners who, it turns out, aren’t fundamentally all that different from ourselves. It is much easier to believe that all Jews are greedy or all Muslims are scroungers if your only experiences of Jews or Muslims come from distorted fables. Something similar may occasionally have played a role in the recent elections in America. The victorious candidate promised many things, but one palpable theme in his campaign was hostility to Mexican (read: Hispanic) immigration. He won the state of North Dakota with 64.1% of the vote, even though only 3.5% of the state’s population identified as Hispanic at the last census. Similarly, he took the state of Montana with 56.5% of the vote, even though only 3.6% of the state identified as Hispanic. Perhaps voters in North Dakota and Montana were uninterested in his anti-immigration rhetoric and voted entirely on economic grounds. Just as Chalabi carefully noted with Clacton, there must have been a number of other factors at play, including fears about the decline of manufacturing, traditional voting patterns, dislike of the opposing candidate, etc. But if there was a portion of the populace swayed by anti-Mexican sentiment, those voters must have had very little experience—if any—of actual Mexicans. The point is worth repeating: in the aforementioned states, most of the people whose vote was decided on account of their dislike of persons of Hispanic descent did not actually live anywhere near Hispanic people. Visby, capital of Gotland (now a part of Sweden). Image courtesy of the Städtebund die Hanse. Was something like the “Clacton effect” also going on in medieval Scandinavia? Were images of Jews more compelling because the overwhelming majority of people had never met one? The brief miracle stories that arrived in “booklings” (Old Norse: bæklingar) are usually understood to have been objects for spiritual meditation. But, in remote Iceland in particular, when they were being read aloud to congregations by preachers, they may have also functioned like news bulletins. They are concise reports of things happening in the wider world, far from the frozen north. The events inspiring this festival are those which happened in Constantinople […] In that town in Germany which is called Güstrow […] This Lord, the crowned one, is your namesake William, whom the Jews crucified in Norwich in England on Good Friday. When the city is left unnamed, it is often introduced with the formula: “In a city” or “In a certain populous city” (í nǫkkuri fjǫlmennri borg). It feels almost as though the Old Norse translators of these tales are stressing to their audience: “we’re lucky, it couldn’t happen here in nice, quiet, rural Iceland—yet”. Unfortunately, anti-Semitism in medieval Scandinavia was not bloodless. Even though, so far as we know, no Jews came to any harm in the Nordic region during the entire Middle Ages. In the summer of 1350, in the city of Visby on Gotland, nine men were burnt at the stake. We know that two claimed to be Christian priests (they may have been properly ordained, or they may have been wandering lay preachers). We only know the name of one of the men: Tidericus the Organist. In Europe as a whole, burnings like these were fairly common. The Black Death was ravaging the continent, and in many cities the local Jewish population was being accused of causing the sickness by, allegedly, poisoning wells. But Visby had no Jews to get the blame. ” … how he would poison all the wells in the cities of Stockholm, Västerås and Arboga, and every lake, fresh water source, and various wells as he travelled around Sweden …”. Letter B from Mscr. Dresd. A 59, 232r (Northern Germany, 1428-1434). Image courtesy of SLUB Dresden. According to the accusations preserved in two letters, Tidericus was supposedly given his poisoning equipment by a Jew in Dassel, Germany, called Aaron, son of Solomon the Wealthy. A Jew by the name of Moses is said to have given him even more poison while he was in Lübeck. Of the two letters, one is clearly aimed at a German-speaking audience; let’s call it Letter A. Letter A claims that Tidericus had poisoned the cities of Hanover, Baden, Gronau, Berne, Bockenem, Serstadt, and Hildesheim—all cities in Germany. The other letter, Letter B, appears to be aimed at a Scandinavian audience. In the latter letter, Tidericus is said to have planned to poison “Stockholm, Västerås and Arboga, and every lake, fresh water source, and various wells as he travelled around Sweden”. If Letter A is an example of Hanseatic administrators telling familiar lies, then Letter B is arguably an example of Scandinavians participating in the fantasy of a Jewish war against Christianity. The absence of Jews across Scandinavia during the Middle Ages did not mean that they were universally regarded as monsters. Perhaps the Clacton Effect was no more reliable then than it is today. The Icelandic bishop Brandr Jónsson (d. 1264), who also visited Norway and possibly France, wrote a saga which narrates Jewish history from the Maccabees up until the fall of Jerusalem in the year CE 70. An Icelandic depiction of an armored elephant. AM 673 a II 4to, 7v, the Icelandic Physiologus (Iceland, c. 1200). There were limits to Brandr’s sympathy, of course. He was still a medieval person. Respectful interfaith-dialogue was not commonly practised in his age. For example, his account of the siege of Jerusalem has a few clumsily anti-Jewish overtones, where the destruction of the city is posited as divine punishment for the Crucifixion (a staple of medieval Christian belief). But, in the overwhelming majority of the saga, Brandr does something that even a minority of contemporary Christians still fail to do: he understands Jews to be human beings living their own lives, rather than being servants of his own theological preoccupations. The tragic case of Tidericus is one instance where people accepted an idea, given to them by their social superiors, that a group of people they’ve never met is their enemy. The people of Visby in 1350 were scared and demoralised. The German-speaking half of the population was probably already used to the proposition that Jews employed Christians to perform well-poisonings. When the Scandinavian-speaking half of the population was sold the same lie, they do not appear to have questioned it. Innocent people were murdered as a result. The case of Brandr is, for me, a more uplifting story. He was a man who refused to accept strangers as scapegoats, despite the prevailing ideological climate of his age. We have been offered the same choice. We told that we are under attack by a particular religion, and that only through cruelty can we be made safe. In the face of calls from our rulers for religious war, I hope we have the brains and the heart of Brandr Jónsson. Ashurst, David. “Kings, Bishops, and Laws: The Old Norse-Icelandic Version of 1 Maccabees” in Myths, Legends, and Heroes: Essays on Old Norse and Old English Literature in Honour of John McKinnell . Ed. by Daniel Anlezark. (Toronto: University of Toronto Press, 2011) pp. 133–147. Wolf, Kirsten. “An Old Norse Record of Jewish History”, The Jewish Quarterly Review 77, 1 (1986) pp. 45–54. Wolf, Kirsten. “The Judas Legend in Scandinavia”, The Journal of English and Germanic Philology 88, 4 (Oct 1989), pp. 463–476.